Summary: Reaching out to new audiences is one the main challenges for any market. Especially the contemporary art market is concerned when it comes to revitalize existing and tap into new audiences. Even if the scope of this study is limited to the United Kingdom, the results reveal the enormous potential for private contemporary art galleries in other countries. Although this study was published in a momentum when the sky seemed the limit for the contemporart art market and its scope is limited to the United Kingdom, the findings and suggestions presented in this study are ever more valid. 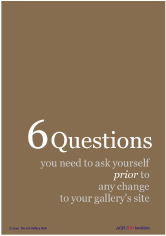 Covering all arts, the perspectives for private contemporary art galleries are overwhelming. It's not a matter of price setting, but rather creating new openings and stimulating the demand towards audiences that are already ready to buy. Summary: Many of you would tend to dismiss any study coming out under their auspices of the CINAO as "having nothing to do with my gallery". However, do not let yourselves be misled by the cover picture of this particular CINAO study. Clare McAndrew's study explores the profession in all its facets and offers essential insights as to why and, above all, how the business is changing. The study highlights the challenges galleries face and weights a range of their key competitive advantages such as expertise, services and recourse. While the report seems but a concise overview of the study's findings, it still contains a wealth of insights for all private galleries, contemporary art galleries included. Its main merit is to offer for the first time a full-scope survey and plenty of data that confirm some intuitive findings. There is a major systemic shift going on in the art gallery world. Gallery visits are declining, the growth and spread of the international contemporary art fairs, worldwide - 305 (!) and counting - increases the pressure on retail galleries (as sometimes galleries do more business at the fairs than at their gallery). Meanwhile the global art market concentrates more and more in a handful of international centers. In not even a decade, a brand new powerful layer of influencers and key role players has managed to create a nest for itself above the traditional gallery system. This study offers an excellent analysis of all the facets of the current art gallery world. From dealers' backgrounds and demographics, over the different of dealer's business models to collectors' demographics and expectations. finally the online channel is growing as an integral communication and marketing device. Personally, I find particularly instructive the pages covering the competitive advantages of galleries and the results of the collectors' survey. Among other topics, the study reviews the advantages and disadvantages of buying through a dealer, the collectors' perception of the role of a dealer, the interaction with dealers, the different collectors' purchasing channels, and the differences between old collectors and new buyers. The graphics and tables inserted are almost an open invitation to start comparing yourself! Feel welcome to comment, ask any additional information or suggest a brochure of interest for colleagues. Looking for more interesting resources? Check here for books related to the profession and especially some high-performance web tools.